Another human who has stepped out of the Drone Zone, and I was able to help. (The Drone Zone is that place where you stay…even though you don’t want to, while you live, work, or play, as a silent, hurting, walking zombie, who’s soul feels crushed every minute of the day.) Sounds dramatic, but it is real. I warn people about hanging out with me personally or professionally, because I’m usually the one to say something like Then why the hell are you doing it?! Let’s make a plan and get you the heck outta dodge! I expect the same from people who give a hoot about me. Often there are tears, or someone gets pissed at the other for being brutally honest, but everything evens out. The truth is one tough, and not so delicious cookie most of the time. Humans are killing themselves. LITERALLY KILLING THEMSELVES, because they feel stuck, and unsupported in making change. Just last week within 2 days, I heard about 3 (THREE!) friends of friends who committed suicide. THREE you guys. The sadness that runs through me for all the people that love those people makes me want to throw up. I don’t have the answer….but I’ve always thought that at the most simple level, if you’re walking this earth on any given day feeling just blah, thinking that someone or everyone at any and every minute would judge you for quitting or changing (your job, your wife, your hobbies, your friends, etc. )- any of us (this includes us “happy,” productive ones who have oodles of friends and family), could quickly end up in very, very dark places. 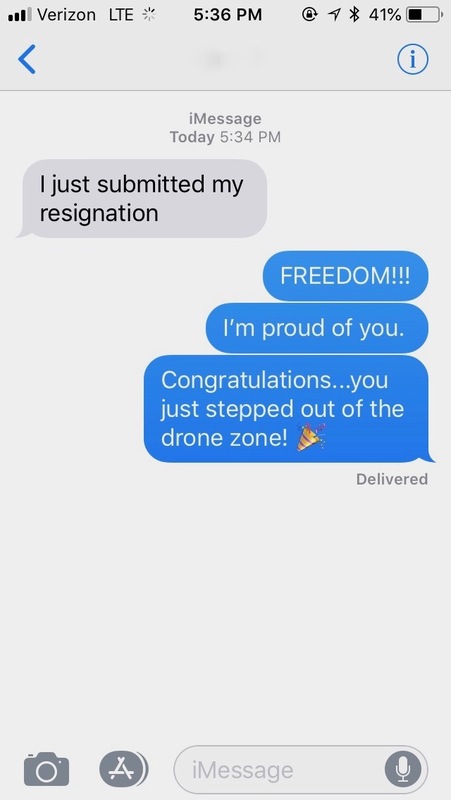 There’s no better feeling to me, than guiding someone (friend or client), to run fast and furious out of their Drone Zone, and seeing them fly. The person above reached out to me several months ago. She was suffering in her job, but felt obligated to stay. She had well given it her all, and yet still felt guilt (totally normal) about leaving. I assured her that nothing was worth torturing herself, but if she wanted to keep pushing, to just please make sure when it crossed the line of soul-crushing to call me, and I’d be right there to help her game plan a respectful and healthy exit. And I was, and she did, so we met this weekend. And then she quit her job today. And I am so damn happy for her. Hide your children, your husbands, and your friends before I get ahold of them…because if they tell me they’ve tried their damndest, or just don’t want to whatever anymore, I will stand on the front lines, and skip with a bunch of balloons straight down the Blue Lollipop Road to Quitsville with them, then launch them into whoever or whatever we find that’s a better fit. I refuse to not speak up when I see someone suffering. If all of us bruised beauties were brave enough to share just how twisted times in our own lives have been, maybe we could save someone else’s. Speak up, stand up, and let’s all push to close the door to the Drone Zone, forever. Yes. Too many duties at church and I resigned from all of them. It felt AMAZING to let go and let younger people shoulder the burden. Making a decision to reduce stress actually reduces stress.